Founded in 1926, the Detroit Red Wings compete in the Atlantic Division of the Eastern Conference in the National Hockey League (NHL). The Red Wings was initially known as the Detroit Cougars till 1930. The name was then changed to Detroit Falcons and in 1932, it became the Red Wings. As of 2016, this Detroit-based team had won the most Stanley Cup Championships than any other franchise in the US and third overall in the NHL, behind the Montreal Canadiens and the Toronto Maple Leafs. And this year again, the Red Wings are locked and loaded and are ready to regain hockey glory. Led by a group of hungry veterans and a promising young talent, Detroit looks poised to take over the Atlantic Division and bring the Stanley Cup back to "Hockey Town." Looking to stand in their way are rivals, the Boston Bruins and the Pittsburgh Penguins. Get your Detroit Red Wings tickets and head down to the "Joe" to lead your team to championship glory. Colorado Avalanche – Red Wings Brawl - The game that took place on March 26, 1997, at the Joe Louis Arena in Detroit, is perhaps one that fans of either side would never forget. Moments into the game, a brawl started that has been given various nicknames over time - Fight Nigh at the Joe, Bloody Wednesday and Brawl in Hockeytown. The game eventually ended with McCarty scoring in overtime and helping the Red Wings to a glorious victory. McCarty was at the center of the brawl that had taken place earlier in the game and for him to score that goal which put the last nail in the coffin of the Avalanche, made the victory all the more sweeter for the Reds. The end of the 42-year Stanley Cup drought - The date June, 7, 1997, is important for every Red Wings fan as it saw the Stanley Cup return to Hockeytown for the first time in 42 years. The Detroit Red Wings won in a complete sweep of the Philadelphia Flyers at the Joe Louis Arena to win their first championship since 1955. Nicklas Lindstrom scored the first goal of the game putting the Red Wings up 1-0. This was followed by a goal from Darren McCarty, who made it 2-0 at 13:02. On top of that, Mike Vernon made 26 saves during the game, allowing only one goal by Eric Lindros, that too, with only 15 seconds remaining on the clock. Toronto Maple Leafs - The Toronto Maple Leafs from Canada is one of the biggest rivals of the Red Wings. Although they were separated due to realignment in 1998, the two teams have never stopped hating each other. Both the teams compete in the Atlantic Division and meet four to five times in each season. The first ever game between them was played in 1927. Between 1929 and 1993, the two teams met each other in the Stanley Cup Finals for a total of seven times. With 778 meetings so far, and many more to come, the rivalry is hotter than ever. This preseason, the teams will face each other on September 29, 2017, at the Little Caesars Arena and on September 30, 2017, at the Ricoh Coliseum in Toronto. Chicago Blackhawks -The Blackhawks – Red Wings rivalry is one of the most historic in the NHL. Before the 2013-14 league realignment, it was classified as amongst the most intense in the Central Division. The first time the two clubs faced off against each other was in the 1926-27 season – the inaugural season for both teams. Since then, the two have met a total of 814 times, with Detroit leading the all time series record, 405-311-84-14. The greatest player in the history of Detroit Reds would have to be Gordie Howe, though some might debate that Steve Yzerman should be given this title. Howe is the third best player of all-time and no one was able to match his durability and toughness, along with his talent for scoring. 25 of his 26 career years were spent with the Red Wings. Steve Yzerman is an equally big name for the Red Wings. He was drafted in 1982 and has been the soul of the franchise since. He led the Wings to three Cup victories in his career and was the longest serving captain in the history of NHL, from the age of 21 till 41. When speaking of great players from this team, the name of Niklas Lidstrom comes to mind. He was the first European captain to win the Cup. Lidstrom was without a doubt the best defenseman in the history of the franchise with six Norris trophies under his belt. For anyone looking for Detroit Red Wings playoff tickets or season tickets, it would be advisable to know a bit about the venue beforehand. Make sure you take a detailed look at the seating chart, arrive at the right time and take your seats before the game starts. The Joe Louis Arena is definitely going to give you an experience unlike any other! Step inside Joe Louis Arena on the downtown waterfront and behold the retired jerseys of all-time greats including Gordie Howe, Steve Yzerman and Sid Abel. Be a part of the home ice advantage and cheer on your Red Wings and even take part in the historic "Octopus" traditions at the Joe. The 2018-19 season promises to be one entertaining ride. Led by their coach Jeff Blashill, the Red Wings are ready to face their toughest and most vicious rivals this season. Our process for purchasing cheap Detroit Red Wings tickets is simple and fast. There are so many online ticketing sites, that it can be hard for customers to find the right place to buy Detroit Red Wings tickets at the cheapest price. At ScoreBig we think of our customers first and foremost. We offer daily deals for Detroit Red Wings events, so our customers can get the best seats for the best prices. ScoreBig will always go above and beyond to offer the cheapest Detroit Red Wings tickets on the market. The Detroit Red Wings schedule above, displays all available events for 2019 and 2020. Once you find the event that you would like to go to, click the red “Get Tickets” button. It is located on the right-hand side of the event listing, it will take you to an Detroit Red Wings event ticket page. ScoreBig's event ticket page will display all available Detroit Red Wings tickets for that event. On the event ticket page to help with your search for the right Detroit Red Wings tickets, use the filters at the top to select quantity, price range, and more. There is also an interactive seating chart so you can pick where you want to sit. When you are ready to buy a ticket, click on the listing, and you will be directed to ScoreBig's checkout page. Upon completion of the information fields, your order will be processed and your Detroit Red Wings tickets will be delivered via email, mail, or to your mobile device. What makes ScoreBig’s site stand out from the rest? We are constantly analyzing our competitors to improve our site, service, and prices. ScoreBig.com employees strive to offer the best process and experience to buy cheap Detroit Red Wings tickets. Our goal is to get you the best seats to Detroit Red Wings events. We offer daily discounts on our site and for special promotions check out our newsletter. If there are no Detroit Red Wings events currently available, you can use our search feature at the top of the page to see a list of all popular events going on near you. No matter your price point, we have all the best deals and discounts on Detroit Red Wings tickets. For more information on prices of Detroit Red Wings tickets and the schedule for Detroit Red Wings, check out our listings above. The last thing you want to find out is when the Detroit Red Wings event you wanted to go to is sold-out. Don’t worry in many cases ScoreBig has affordable tickets to sold out events. We sell tickets from GA all the way to premium seating and parking. Skip the scalpers in the parking lot and get your tickets online from top Detroit Red Wings ticket brokers. We get you in all events, buy your Detroit Red Wings tickets here from a brand that many trust and rely on for all their ticketing needs. ScoreBig offers a 100% money-back guarantee. If you have been in search of cheap tickets for Detroit Red Wings, ScoreBig by far is the best option. That’s why ScoreBig has more loyal customers than any other ticketing site. 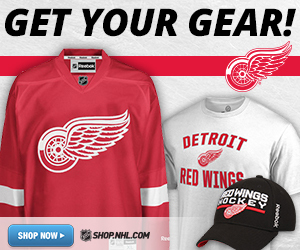 Shop at ScoreBig for safe and secure Detroit Red Wings event tickets.